Commodities are correcting as forecast. Mainstream journalists are practically replicating parts of last month’s subscription report. As expected, the real economy is ready to tumble without credit flowing from the financial institutions. The FDIC takeover of IndyMac bank does not surprise us either. With IndyMac’s failure, the FDIC deposit insurance fund has been depleted by 8% to 16%, (based on preliminary estimates). Concerns about the $50 Billion dollar fund are causing the FDIC to raise their insurance premium on banks. Also calls to the FDIC helpline have doubled over a year ago according to Reuters. Oddly enough, almost exactly one year ago, we were calling the FDIC helpline researching details for our clients. CD’s - What A Pain! The FDIC takeover of IndyMac Bank was far from flawless. We encourage everyone to watch the video. Are you on the list? Frankly, we prefer not to wait in line to get our money. Reports of online banking and ATMs being inaccessible are also a concern. So we recommend that folks have up to two months worth of cash under the mattress or in the cookie jar. Why two months? Because after Sheryl MacPhee, a depositor at IndyMac, received her check from the FDIC, she tried to deposit it at Washington Mutual. WaMu said they would put an eight week hold on the check. (Wells Fargo said it too was placing holds on many IndyMac checks as a precaution.) And this was during only one bank failure. Gerard Cassidy, an RBC analyst, expects “as many as 300 of the country's 8,494 banks and thrifts are likely to fail over the next three years.” We expect quite a few banking holidays as this crisis continues. Instead, U.S. Treasury Bills (a direct loan to the U.S. Treasury) should be held as cash. T-Bills force the Treasury to pay you on time, allow you to protect billions (buy as many as you like in $1000 increments) and let you maintain full ownership over your funds if held at a Trust Company (more on that later). Why would anyone ever want a CD? 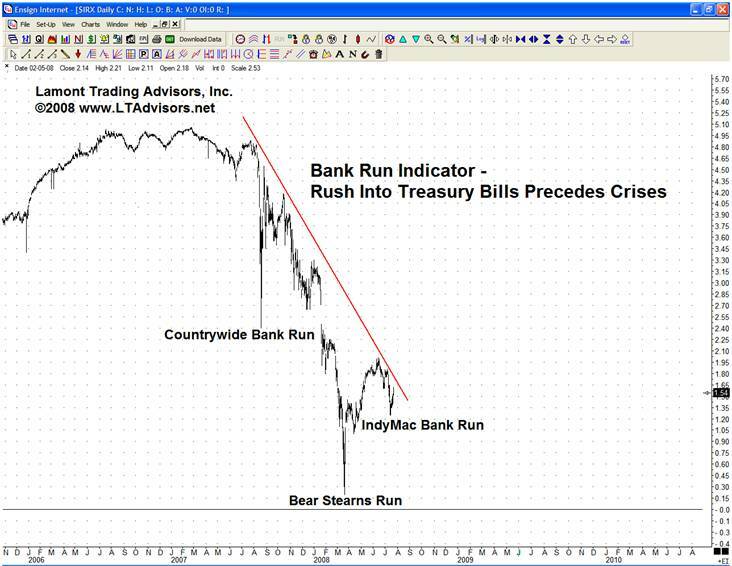 As we pointed out last August, the Treasury Bill Yield shows investors rushing into cash. The yield falls as investors buy T-bills and depositors run. Same action, different venue. Trust Company - According to the American Bankers Association: “Assets held in custodial accounts in the trust department of a bank do not become assets of the bank and are segregated from the bank’s assets.” More importantly, “Account ownership in the assets remains vested in the individuals or entities for whose benefit the bank is acting as custodian and the assets are not subject to the claims of creditors.” The FDIC has confirmed this. Since this is the strongest claim of ownership, retirement and high net worth accounts are held in custody accounts at a Trust Company when you open a LTA U.S. Treasury Bill Account. Brokerage Firm – A conservative brokerage firm is the next step down in ownership claim. Only two brokerages in the country have made it through our selection process (the third we had to pull accounts from due to a merger). Why is this even a concern? Securities held at a brokerage firm are in ‘street name.’ This means they are registered under the name of the brokerage at the DTC, the system-wide clearing company. Brokerages then record on their books that they hold securities for the ‘benefit of the owner’ held at the DTC. What an individual client of a brokerage firm really owns is a percentage of the securities held in the client pool. This is not full ownership. If an investor has a margin account, the brokerage company may lend out those securities. (Even if you do not, but the brokerage firm promotes margin accounts, securities lending could diminish the client pool in a systemic crisis.) Also highly leveraged client bets may create losses that affect the entire client pool, as happened in the failure of MJK Clearing. So in our view, accounts held at Wall Street investment banks and brokerage firms that deal with leveraged players are not secure. When presented with the evidence, most folks would prefer to deal with only highly rated financially stable brokerage firms. Bank – Frankly, we do not want to be depositors or creditors at any bank. Banks are even wary of lending to other banks. Instead, cash can be held at more secure institutions. Debit card and check writing capabilities can also be obtained at institutions less likely to be ‘bailed’ out by the government. As John Bovenzi, the FDIC's chief operating officer, recently stated: IndyMac bank “is as safe and as sound as any bank in the country right now.” (Cough.) As we discussed two months ago, comparing bank stock prices is the best determinant of financial health if you have to have a bank account. While stock prices can change, perceptions do create reality. Over-the-limit depositors are at the mercy of the FDIC. "We have tried spending money. We are spending more than we have ever spent before and it does not work. And I have just one interest, and now if I am wrong somebody else can have my job. I want to see this country prosper. I want to see people get a job. I want to see people get enough to eat. We have never made good on our promises. I say after eight years of this administration, we have just as much unemployment as when we started. And enormous debt to boot." - Treasury Secretary Henry Morgenthau, 1939. The ocean and its inhabitants are an apt metaphor for global financial markets. The first twenty minutes of The Blue Planet, a fascinating documentary jointly produced by the BBC and the Discovery Channel, may help investors better understand the financial world. The first clip describes the Federal Reserve’s fiat credit system, economic waves, and global financial centers. The second provides a look at financial market participants, the schooling of financial behavior, and the volatility of bear markets. We have had quite a move down in the major stock indices over the last two months. We wouldn’t be surprised if we corrected upwards or for a few weeks. This would set up the major down wave for the fall. We hope you are able to secure your funds. If you would like assistance, just contact us. Expect Friday afternoons to get more exciting as that is when the FDIC historically announces bank failures. The fire sale forecast last October continues. Congratulations on Your New Home, Glad We Could Make Your Day! Perhaps you would humor us by filling out our quick survey to better understand our current online readership. This will allow us to improve The Investment Analysis Report. We appreciate any feedback.